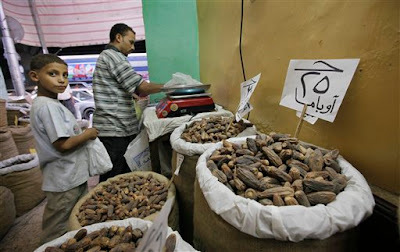 Following President Barack Obama’s message to the Muslim world, Egyptian fruit sellers have taken on the friendly gesture to name their best dates of the year after the President. "We love Obama and so we named our best dates for him…we put a sweet date in Mr. Obama's mouth and a message in his ear…please help to bring peace to the world. We have a lot of hope in you." (Aif Hashim, shop owner, Cairo). Hundreds of labourers are busy loading trucks with dates in the small town of Khairpur, 40km north of Karachi, to meet the growing demand during the holy fasting month of Ramadan. “Dates trading reaches at its zenith before and during Ramadan as every one wants to break fasting with dates in line with the saying of noble Prophet Muhammad (be and blessing be upon him),” Mohammad Bahsir Mahar, president of the dates market association, told IslamOnline.net. Pakistan is the world’s fourth largest dates producer after Egypt, Iran and Saudi Arabia. The south Asian Muslim giant is also the world’s second largest dates exporter. Locally known as Khajji or Khajoor, dates see a heavy demand during the dawn-to-dusk fasting month. This year, Pakistan has produced 600,000 tonnes of dates for local consumption and exports. “We have got abundant crop (dates) this year, but still we are facing difficulties in meeting the demand for Ramadan,” said Mahar. Pakistan’s south-eastern and north-eastern areas are the country’s best places for cultivating dates for their rich soil and abundant sunshine. Long queues of dates trees are a normal scene across the road from Khairpur to northeast Pakistan. Besides Khairpur, the coastal belt of south-western Balochistan province, Dera Ismail Khan, Multan, and Sukkur are also famous for dates production. There are more than 300 varieties of dates in Pakistan, such as Karbalaee, Aseel, and Madni. There are also Dokka (hard yellow date), Chohara (dried dates), and Dung (half date and half dokka), which see a high demand during the holy fasting month. Ahead of the start of the fasting month, dates exhibitions become a normal scene across Pakistan. “We receive most of the orders at these exhibitions,” said Mahar. “Not only in Ramadan, but besides that, India is a major buyer of Pakistani dates. Not merely Muslims, but Hindus too use dates in their ritual ceremonies. The booming of dates trading during Ramadan provides an additional source of income for hundreds of thousands of Pakistanis. Hundreds of female workers could be seen sprawling dates on huge straw mats as their male colleagues collect dates from the trees. Hundreds of Pakistanis could be seen gathering around stalls and handcarts carrying dates parked outside mosques, offices, intersections and bus and railway stations. “Every year (during Ramadan) I set up this stall to earn additional income to meet my `Eid expenses,” said Khushal Khan, a peon at a local company, who sells dates at a small stall outside a Mosque in Saddar, the downtown of southern port city of Karachi.